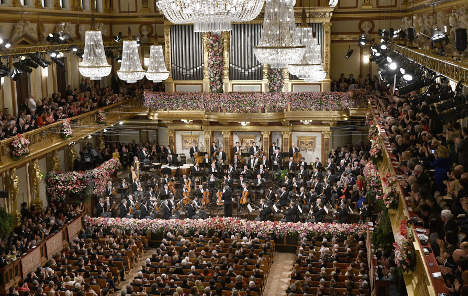 The Vienna Philharmonic did its best to give a troubled world a soothing start to 2018 on Monday with its traditional New Year’s Concert, broadcast live in over 90 countries. The annual extravaganza, heavy on light-hearted waltzes by the Strauss dynasty harking back to Vienna’s 19th-century golden era, is watched by some 50 million people, the Philharmonic said. His greying hair flopping in time to the music, the conductor this year was Italian maestro Riccardo Muti, waving the baton in the hallowed Golden Hall of the Musikverein for the fifth time since 1993. The 76-year-old has conducted some of the world’s most prestigious orchestras including the Berlin Philharmonic, the New York Philharmonic and the Orchestre National de France. Alongside Strauss favourites like “The Blue Danube”, the 2018 programme also featured the Overture to “Boccaccio” by Franz von Suppe and Alphons Czibulka’s “Stephanie Gavotte”. In the audience was Sebastian Kurz, since mid-December Austria’s chancellor and the world’s youngest leader at 31, accompanied at the Musikverein by Dutch Prime Minister Mark Rutte. Other guests included the presidents of Estonia and Bulgaria. Bulgaria took over the rotating EU presidency from Estonia on January 1st and will hand it to Austria mid-year. Kurz’s conservatives formed a coalition with the far-right Freedom Party (FPOe) last month, giving it the interior, defence and foreign ministries as well as the vice-chancellorship.